The 3210 deadbolt lock offers maximum security and a Lifetime Mechanical Warranty, and features a built-in deadbolt with a free-spinning stainless steel core that cannot be cut. The deadbolt lock is Teflon coated with LockeyUSA's special Marine Grade finish*. Ideal for gates and pool areas. 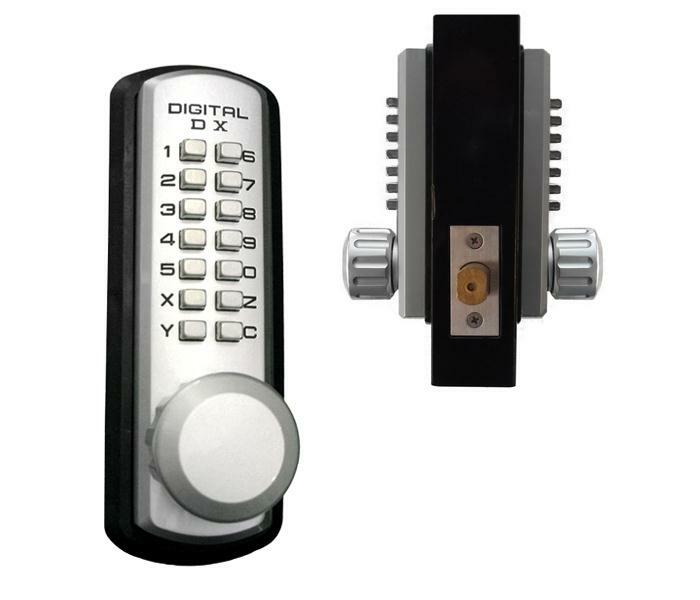 This lock is easily accessible from either the inside or the outside by just a turn of the knob with the deadbolt function. Combination can be 2-7 digits in length with tumblers provided. If you would like your combination to be 0-9 digits in length, please purchase the Tumbler Kit. *Marine Grade finish closely resembles the color of a satin chrome and is ideal for saltwater environments where the lock will sustain consistent exposure to the elements.The Marine Grade finish has a much longer lifetime than a standard finish and provides added strength against the corrosive elements in saltwater environments.